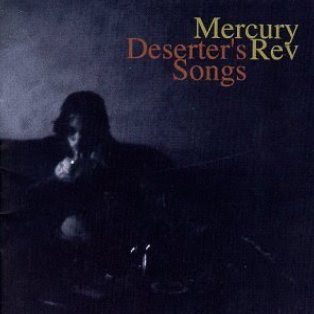 In 1998 Mercury Rev released Deserter's Songs, their most accomplished album and a true modern classic! An amazing work of art filled with fairy tale imagery, gorgeous melodies, strings, lyrics, artwork all wrapped up in 12 beautiful songs. Before this album there were glimpses of Mercury Rev's genius, but it wasn't until Deserter's Songs that they really hit their stride and mass pop stardom. I first found out about this album in 1999 as I was reading NME's top albums of 1998 and this was sitting pretty as NME's #1 Album of 1998. A pretty amazing achievement for an experimental band who previously was known for being too experimental and loud. I read they got shut out from Lolapalooza one year for being too loud. That from a tour that would routinely feature Industrial Acts like Ministry. Once I bought this album I instantly feel in love with it and them. Unlike their previous efforts this album was almost all ballads. Beautiful strings, bowed saws, melodies and choruses all as if from a dream or coming directly from heaven itself. For awhile Mercury Rev and the Flaming Lips with which they share some history were two of my favorites. Deserter's Songs was engineered by Dave Fridmann. One of the most gifted engineers on the planet and who is also a member of the band. He was instrumental in putting this amazing album together. He's also been responsible for engineering many other classic albums like the Flaming Lips 'The Soft Bulletin' which came out the following year and won many accolades for the Lips as well. I revisited Deserter's Songs the other day and it's still an amazing piece of work. I love listening to this album at night, it's just a perfect time for music like this. There are so many amazing tracks on this it's hard to choose which ones to put on here. The whole album as a whole is the way to go. You have to listen to it all in one listen to fully appreciate it's brilliance. The single 'Goddess on a Highway' is probably one of the dancier tracks on here. It has those amazing lyrics in the chorus that proclaim 'when I see your eyes arrive, they explode like two bugs on glass'. Who would ever think to write something like that? But it's perfect, a great track to jam out to in the car and I did so on many occasions. The Funny Bird which is the track right after Goddess is equally as impressive. The moment around the middle of the song when it almost fully stops and then the drums kick back in ever so gradually and with amazing restraint is specatacular! Still gives me chills. Then there's plenty others like Tonite it Shows when he's very nostalgic and recalls 'the way you looked, the way we were, the way we met, the way I lit your cigarette' just beautiful stuff. Holes, Endlessly, Opus 40 all amazing songs as well from a band at their absolute prime and who were able to record it for all of us to enjoy for many years to come. Gotta thank Mercury Rev for this amazing work of art that reminds me why I love music so. It can take you away from life's problems even for a little while and transports you to another place. The way a great movie can as well. An escape from reality even if just for a short while. I think their last album "The Secret Migration" is even greater, and incredibly underrated, even ignored. Also, they are a terrific live band. They don't do gigs, they give 'performances' in the way an orchestra does; every note, every movement every flash of light, every word is clearly meticulously planned for ultimate effect. They are certainly one of the most under rated bands ever. Yerself Is Steam and Boces are 90's classics...but Deserters Songs is one of the most beautifully sad albums ever.